This is something that I am shy to share, my aunt commented that my hair is thinning. How can this be? When I take a closer look, yah it’s true. I noticed that there is balding patch or symptom of getting bald on my left forehead. Maybe this is due to my regular side parting. Not only that, the hair at the center top of my head also getting thinner and recently I have dandruff too. Oh no! I am sad and shy. Every time after I wash my there is so many hair stuck on my bathroom hole cover. When I comb my hair or run my fingers through my hair I can see many hair drops. Sometimes my scalp gets itchy due to the dandruff. 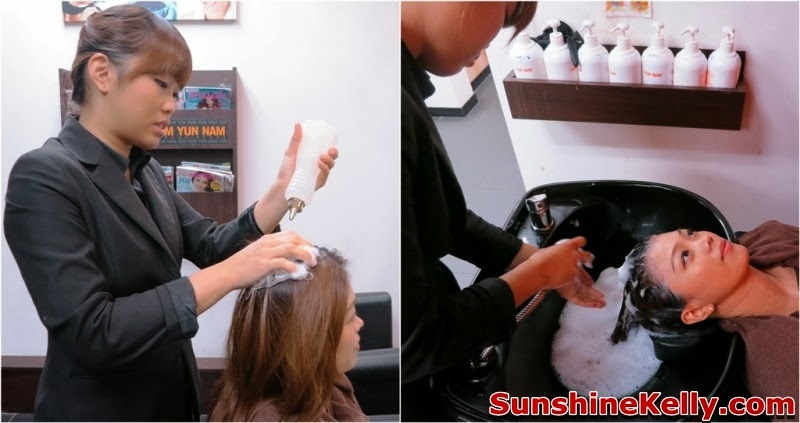 I need help… I tried the Hair & Scalp Treatment @ Yun Nam Hair Care. Before this I have tried using a few types of hair loss and dandruff shampoo, conditioner and serum. But after using that for almost like 2 months my hair loss problem doesn’t improve however my dandruff problem is on and off. 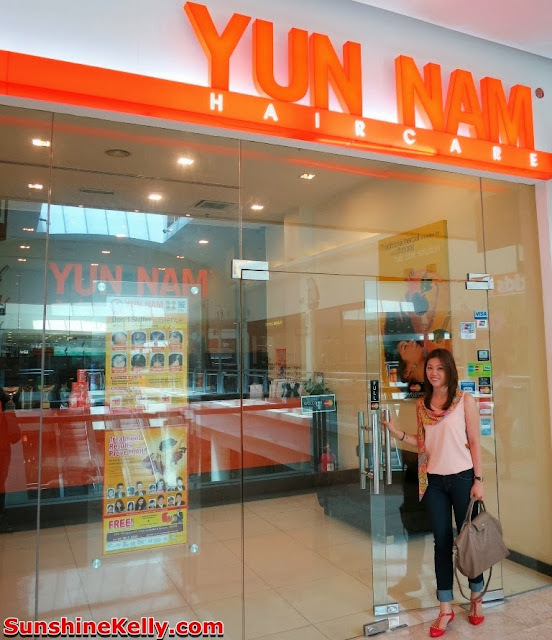 My mother is one of the customers at Yun Nam Hair Care, I can see her improvement after she started her treatment, that gives me the confident to go for my first trial Hair and Scalp Treatment at Yun Nam. Plus the treatments use 100% all natural herbs that are safe and effective. With over 20 years of success, about 250,000 customers have undergone treatment since 1984. 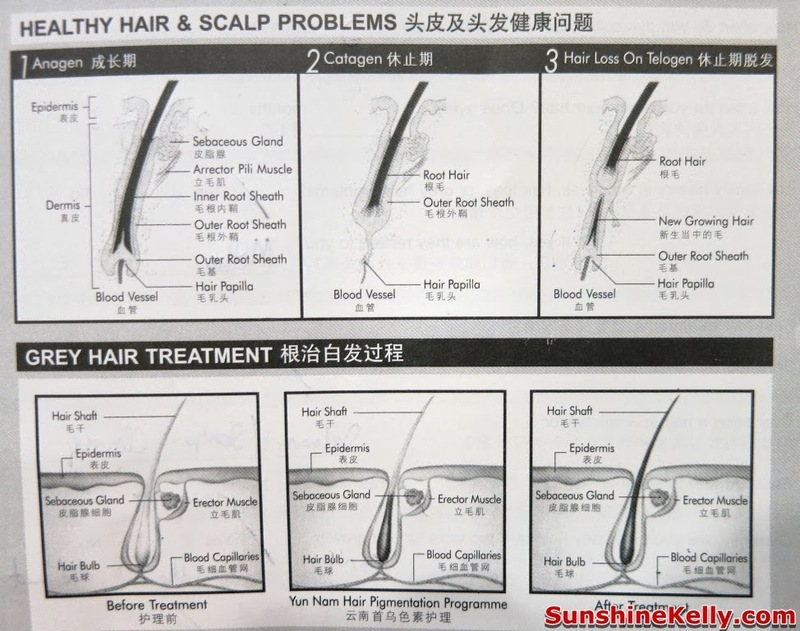 Yun Nam focuses on solving hair problems such as mediterranean hair loss, female hair loss, premature hair loss, post natal hair loss, ring-shape hair loss, dandruff, grey hair, oily scalp, dry hair and many other hair problems using 100% Chinese herbal remedies. Yun Nam is the #1 most trusted hair care brand in Malaysia (metric Research 2010). 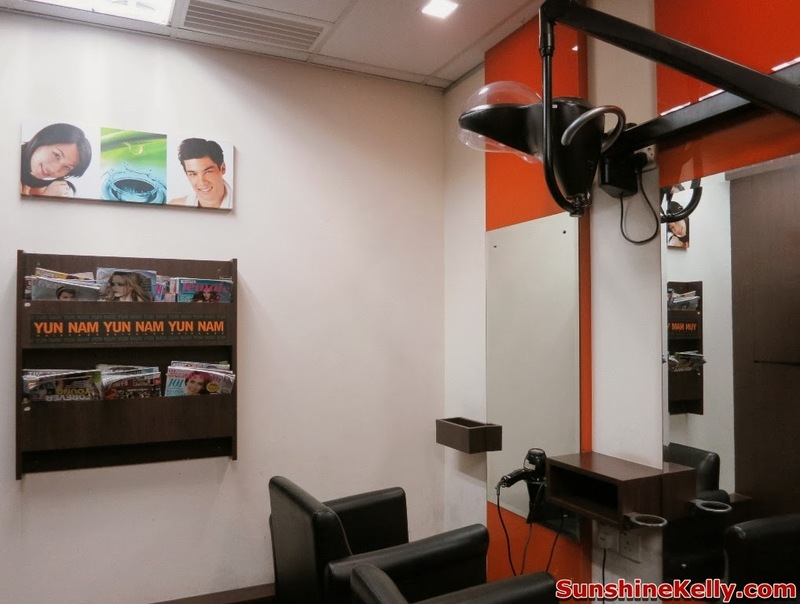 Herbal treatments are customized according to the type of hair problems and the herbal mixture is prepared on the spot in front of me. I was greeted by the friendly customer service at the front desk. Then my consultant Miss Jen guided me to the consultation room and gave a form to fill up my particulars. She asked me some question on normal how I take care of my hair. 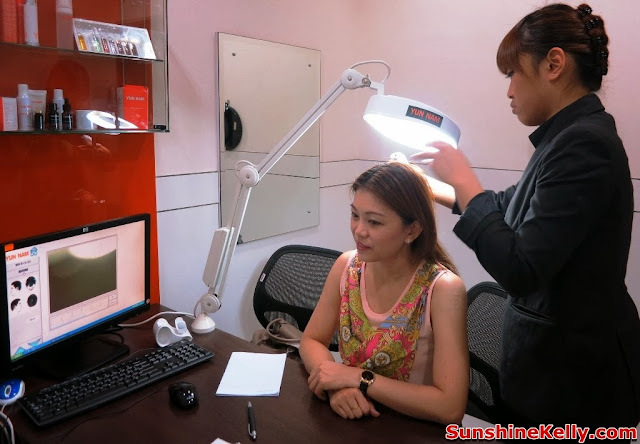 After that she started to scan my hair and scalp using scanner that magnifies scalp image up to 200 times to check what is my hair and scalp problems. When I saw the image it’s kind of scary, I thought my dandruff problem is just mild dry and flaky scalp. Jen is very friendly and knowledgeable she explained to me what are my hair and scalp problems and how it happens plus the steps that I can do to reduce or heal it. Over the image I can see that it’s quite severe and I my left forehead and top middle scalps have symptom of Mediterranean Hair Loss. So what are the actual causes of baldness for women. The perms don’t cause it, hairdryers don’t cause it. Brushing, teasing, and curling don’t cause your hair to fall out. Not even coloring, days in the sun, or any of the other things you do to enhance the beauty of your hair. The true and actual causes of hair-loss fall into three categories: Hereditary Hairloss, Hormone Surges or Imbalances and Serious Health Issues. It’s estimated that 1 out of every 4 women suffer from Female Pattern Baldness. For most women, this begins to manifest around the time of menopause. As for younger women, hair loss can be caused by pregnancy, stress, and an imbalanced diet. After the consultation and scanning, I am ready to start my treatment. The setup of the treatment area is like salon, it’s quite spacious with cozy decoration. The temperature is just right and comfortable. I love the Ginseng Tea too. There are different areas cater for different treatment and for some who prefer privacy there is an area for them too. First of all, Jen wash my hair with Yun Nam Herbalogy Ginseng Shampoo 4 and then she sprayed Hair Renewal Lotion on my scalp followed by Hair Cleansing Lotion. After massaged my scalp for a few minutes then rinsed off. After rinsing she used Jasmine Herbal Conditioner for my hair type. After that she sprayed the Hair Cleansing Lotion. All these hair care products have a mild ginseng, Chinese herbs and flowery scent. 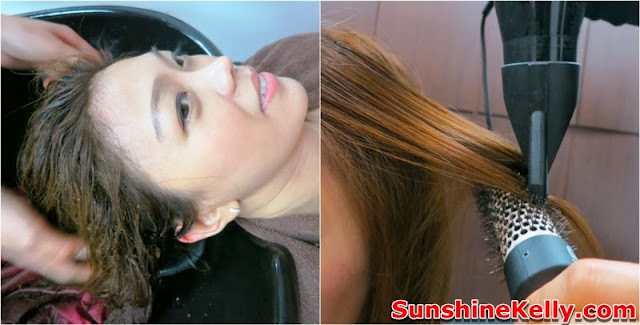 Jen also describe to me about the steps and also the products she used on my hair. After cleansing, my hair and scalp is ready for the herbalogy treatment. Jen mixed a new packet of Herbalogy Formula 3. The herbalogy mix is like dark brown in color and quite thick. It smells like Chinese medicine but not too strong so that is fine for me. When Jen applied the herbalogy on my scalp it feels a little bit warm after a minute is ok. After she finished applying all the herbs on my scalp, she covered my hair with a shower cap and starts to massage my scalp for about 5 minutes especially the problem areas in circular motions to stimulate the nerves on the scalp and increase the absorption levels of the product essences. Then leave it to absorb for about 30 minutes. After rinsing off the herbalogy, Jen blow dry my hair. I am almost done, she led me back to the consultation room and did a round of scalp and hair scanning for me to see the result after the treatment. Immediately after the treatment I can feel that my scalp is thoroughly cleansed. I can see that my dandruff problem has been reduced. My hair looks healthier, not so dry and feels smoother. Jen also explained and showed me how many hairs I dropped during the hair wash. Jen shared some tips to me that I should do scalp cleansing more often to reduce the dandruff and drink more water. After the consultation, she gave me a set of Free Yun Nam Home Care Kit that consist of Herbalogy Ginseng Shampoo 20ml, Jasmine Herbal Consitioner 20ml and Hair Nutritional Lotion 20ml. After shampoo and conditioning, sprayed the lotion onto scalp and massage. This Home Care Kit can last about a week I washed my hair like for times a week. Jen also recommended some suitable products and treatments packages to me. Overall, she is very friendly, knowledgeable and also professional. Overall, after two weeks of the treatment my dandruff problems in now recovering gradually there is no more flaky scalp and my hair now is not so dry anymore. Well, I can see some baby hair start to grow on my left forehead that have hair loss problem. I think for some with hair loss or scalp problems you should not drag it further. Don’t shy away from seeking treatments. The earlier you treat it the easier to recover. 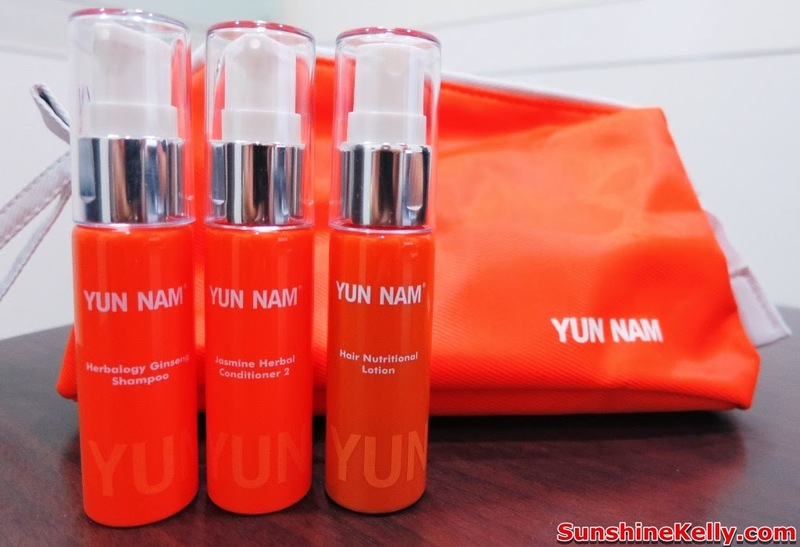 Yun Nam uses natural herbs so it is safe with no side effect. If you hesitate you can go for the first trial. Need to cover up your thinning hair? You can achieve it in just 30 seconds with TOPPIK! Made only with premium quality organic keratin, TOPPIK Hair Building Fibers instantly hide the bald spots and thinning of the hair. The keratin protein is also found in natural human hair. The fibers can offer you the real look of a full head of hair and are completely undetectable, because each microfiber is made differently. Moreover, TOPPIK Hair Building Fibers are hypoallergenic. Without causing any harmful side effects nor irritation, the fibers allow air to pass through your hair and hence the hair follicles will not be clogged. TOPPIK Hair Building Fibers can last the whole day. Not only that, they are resistant to perspiration, rainwater and wind. 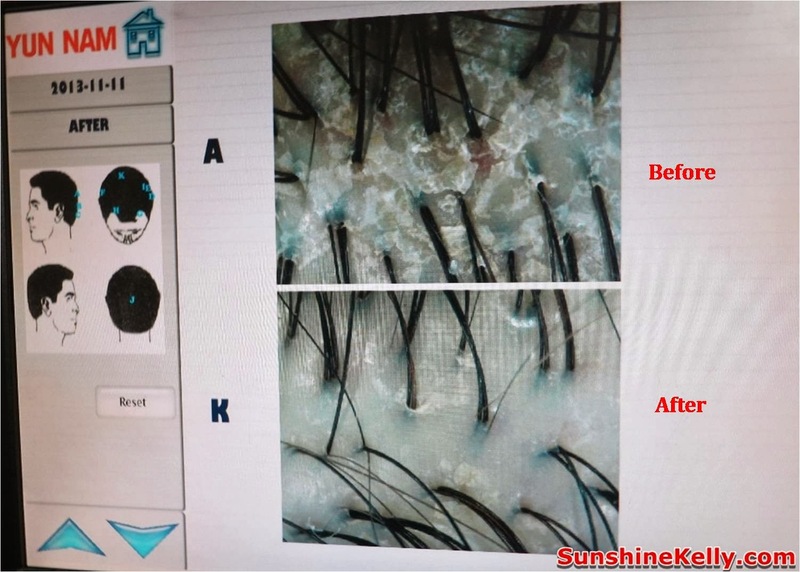 The fibers are suitable for both men and women regardless of age, and they are easy to use. 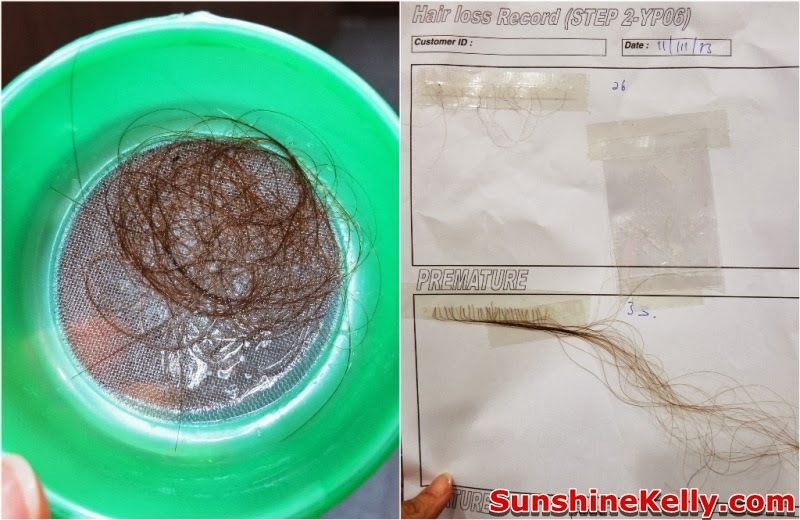 Only shampooing is needed to remove the fibers on your hair. TOPPIK Hair Building Fibers are applicable for many types of hair loss such as thinning, bald spots, receding hairline; or even for beauty purposes like covering white, grey or coloured roots, hair extension enhancements and more. 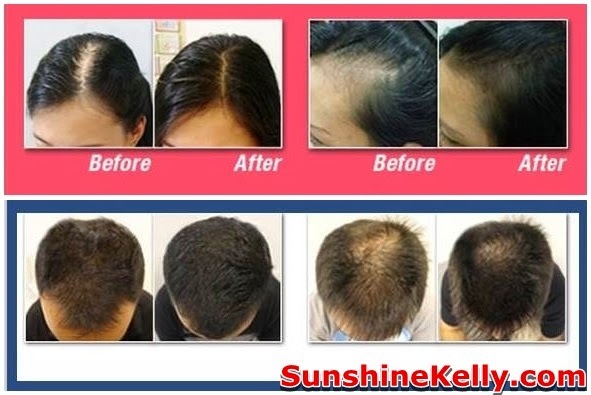 Also, they work perfectly in conjunction with all hair loss products, whether oral or topical. Thus, they are versatile and convenient as TOPPIK Hair Building Fibers are suitable for all types and colours of hair. 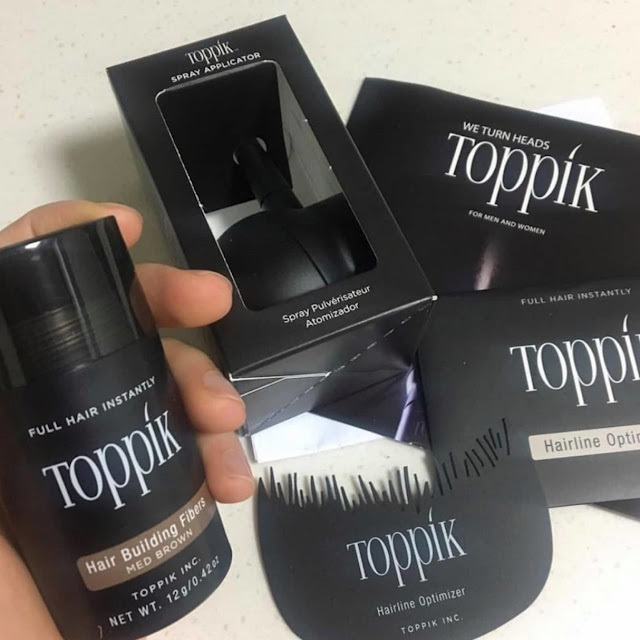 If you have been aspiring for a natural, voluminous look made instantaneously, then grabbing TOPPIK Hair Building Fibers is a smart move. Visit https://toppikmalaysia.com/shop/ to see our range of products.